We’ve been tracking USRM very closely over the past few weeks, since initially mentioning it on the morning of February 27th and witnessing a huge subsequent increase( .014-.0545,+289%). We monitored the consolidation off of that high down to .0175, and once again signaled that it was time to give it our close attention last week on the 15th. The rebound that has since occurred has been very nice, with USRM surging back to .053 yesterday, a jump of 203% over its .0175 swing low. So that’s twice now, in the span of less than a month that we’ve seen a 200% move out of this play. We’re obviously going to continue following it, with the type of price action and volatility we’ve seen so far, USRM is currently a swing-trader’s paradise. We also had a ringer with ICLD earlier this month, when we signaled it on the 2nd before the stock took off from a low of .0157 to a high .0985, a 527% rip. After watching it consolidate off of those highs for a few days, re brought it back to readers’ attention in yesterday’s premarket report, and our attempted timing of the reversal couldn’t have worked any better. From an early low of .0302, the stock steadily made its way up to a high .0439 shortly after 1PM, for an intraday spike of 45% and held more than half of its daily gains into the close, so this one will also remain on our watchlist in coming sessions. 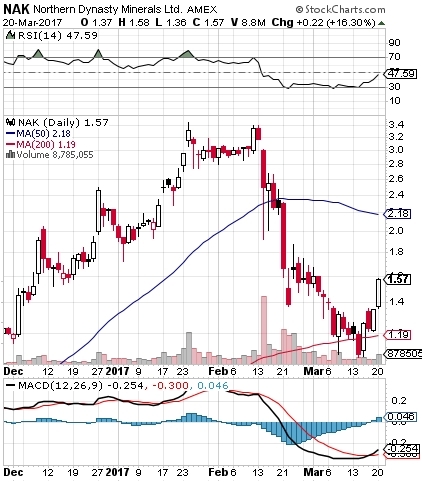 We tagged NAK last Thursday after watching the stock search out a bottom for quite awhile. The stock did bounce, and has thus far posted a 31% increase, reaching 1.58 yesterday and closing just a tick below at 1.57, as you can see on the included snapshot. Also on the chart, we can see that the RSI is on the verge of cracking the 50-line, and the MACD has just crossed in a bullish manner. Conditions seem to be ripe for the possibility of a continued rebound, so we’ll pay close attention to NAK in sessions to come. Last week, we touched upon the fact that the February comments from the White House pertaining to stricter enforcement of federal recreational marijuana laws appear to have walked back by Jeff Sessions. That led us to reassert our interest in closely tracking pot stocks. as the cannabis industry’s feet have been pulled from the fire, so to speak. On Friday, we tagged POTN for the first time after noticing some recent increases in volume and price action, and it was a solid idea for the day. POTN traded in a range from .038 to .055, for chances at intraday gains of up to 45% on volume of roughly three times the monthly average. It led to a strong close, just a tick under a nickel at .049. 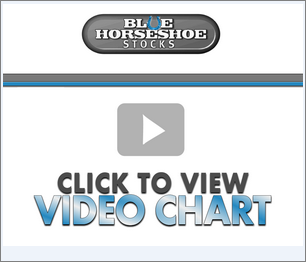 We’ll definitely want to continue to monitor this play as we kick off a new trading week. After noticing it in a bearish pattern, then getting word of an analyst downgrade, we went with a bearish options idea for SNAP on Friday, and it worked out quite nicely for us. We had signaled the SNAP Weekly $20 Puts for possible quick-strike trade opportunities, and it was there for the taking. Those contracts traded up from a low of .30, and reached 1.04, an intraday move amounting to 246% Cheers to anyone who was able to use that move to their advantage! Both of the above-mentioned plays appeared in our reports for the first time ever on Friday, and continuing along that track, we’re going to highlight another stock this morning that we haven’t covered before. 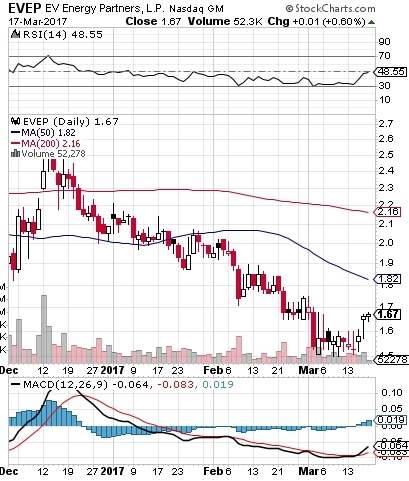 EVEP has the look of a bottom-bouncer as you can see from the following chart snapshot. We’re going to put this one on our watchlist as a potential extended rebounder, with the RSI about to crack above the 50-line and the MACD just having underwent a bullish cross. In yesterday’s report kicking off the new trading week, we backtracked to our alert of ICLD coming in our report from two Thursday’s ago, at which time the stock was trading at a low of .0157. We mentioned how it had risen exponentially since that report, and specifically cautioned our readers to track its movements closely right from yesterday’s opening bell. The strength of the ICLD close on Friday was simply too strong to ignore and despite already having spiked considerably for us up to that point, the stock turned in another fantastic intraday performance. Once again, with the intensely bullish close to another session, we’re going to have our eyes peeled for further moves from ICLD, whether they come in the form of a continued push upward, or are preceded by a dip-and-rip pattern off of these impressive highs. Prior to yesterday, CBR had been stuck in a rut for quite some time, but we noticed some abnormal premarket activity and decided to include it in yesterday’s report. It was a good idea, with CBR running from .4329 to .65, which works out to a 50% intraday pop. The move came in conjunction with the company announcement that it was mulling over an unsolicited offer to be acquired through merger by Ameri Holdings, Inc. (AMRH) which values it at .75/share of CBR stock. Given that the stock is still trading in the low .60′s at present, we’ll be interested to continue to monitor its progress as the company deliberates the merger offer. Cerulean Pharmaceuticals, Inc. CERU - We began tracking CERU just over a month ago, and after an extended period of slow and steady increases, finally yesterday the stock broke out in a more significant manner. 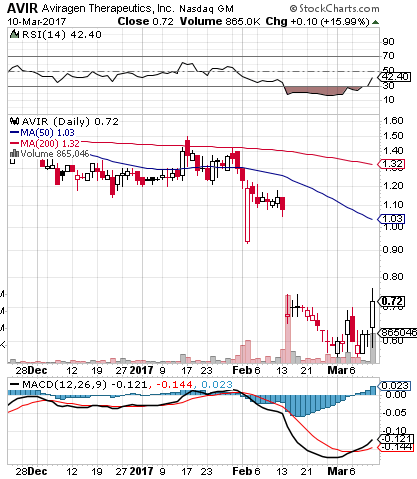 Aurinia Pharmaceuticals, Inc. AUPH - AUPH is another stock we’ve been tracking for much of 2017 so far that also broke to new highs yesterday. We witnessed a low of 2.95 in AUPH subsequent to our alert on the stock dated January 27th. Gradual increases over the next month would occur, and since we’ve hit the month of March, the stock has been going haywire. Yesterday AUPH soared to (and closed at) 10.54 which represents a total move of 257% in less than six weeks!